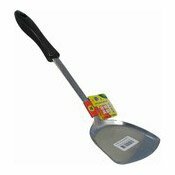 Description: Stainless Steel Wok Spatula. Perfect to use with your wok when cooking stir-fry. Please note, not suitable for use with non-stick pans. Simply enter your details below and we will send you an e-mail when “Stainless Steel Wok Spatula (不鏽鋼鑊鏟)” is back in stock!